Application of the product at newbuilding and as part of a well-planned, lifetime maintenance strategy can reduce vessel life-cycle cost with a corresponding increase in asset value. Intershield© 300 has over d% aluminium, which acts as a barrier pigment and prevents the spread of corrosion at the steel surface. This coating contacts just the right level of aluminium (< 10% by weight in the dry film) to ensure compliance with classification society regulations for use on tanker decks, offering improved resistance to cathodic disbonding and long term corrosion protection. Developed to help both owners and shipyards to comply with local VOC emissions regulations, Intershield® 300HS is a breakthrough, low VOC (volatile organic compound), high solids formulation with over 9% aluminium pigmentation. 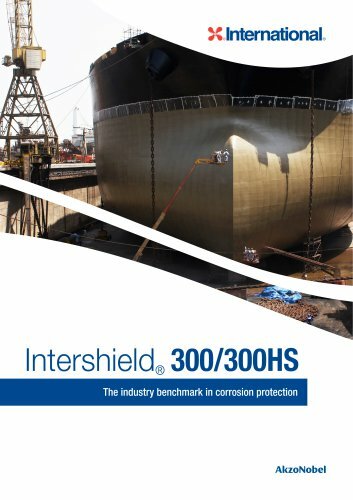 It delivers the same outstanding corrosion control the shipping industry has come to expect from Intershield® 300. Available globally, a number of applications have been done around the world.